This item is available for pre-order. Order today to guarantee that you'll be one of the first to receive it. 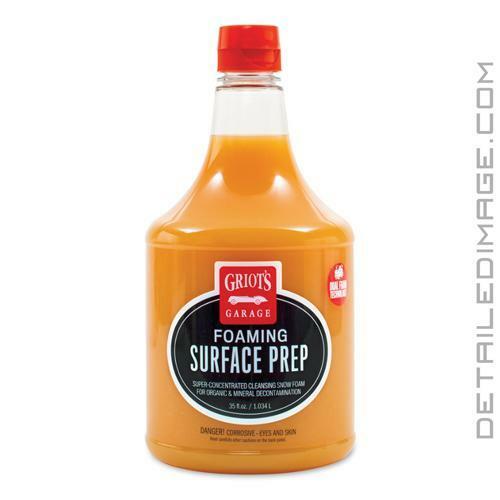 Orders containing this item will ship as soon as we have the 35 oz Griot's Garage Foaming Surface Prep in stock. Estimated ship date: 4/29/19. Check out the 128 oz that is in stock right now. Rinses away clean and easy! 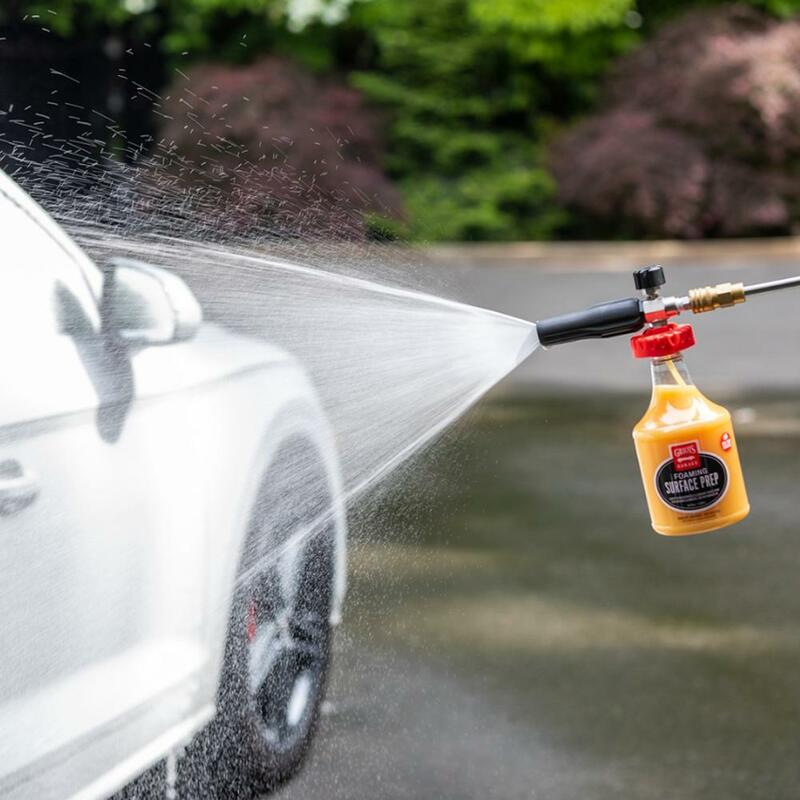 The Griot's Garage Foaming Surface Prep shampoo and degreaser helps you deep clean your paint like few other products can. Before you dive into polishing away imperfections, you want to make sure you thoroughly remove contamination and old protection from the paint. This will allow you to polish away imperfections, instead of pushing around dirt and grime, causing more swirls, scratches, etc. Foaming Surface Prep has a high pH blend of detergents and other advanced active ingredients. This unique formulation produces a thick foam that clings to paint, softening road film and organic contaminants (bird droppings, bug splatter, etc.). Let the product dwell for up to 10 minutes and rinse away. The high pH not only helps remove tough dirt and grime, but also removes old waxes or sealant layers, leaving you with a clean surface ready for your polishing steps. This product can be applied by hand or for the best results, via the THE BOSS Foam Cannon. 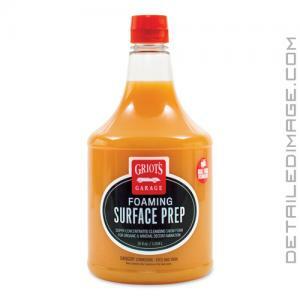 If you are looking for a strong foaming cleaner for dirty cleaning jobs, the Griot's Garage Foaming Surface Prep is a fantastic choice! At a 10:1 dilution, Foaming Surface Prep is ideal for pre-treatment and deep-cleaning of bumpers, grilles, hoods, side mirrors, rocker panels, door jambs, trunk jambs, engines, tires, and wheel wells. The bottle has a mixing guide on the label with fill lines that ensure you get the proper mix every time. Mixing Option 2 - MANUAL-MIX: For a traditional RTU (ready-to-use) option, add the corresponding amount of Foaming Surface Prep concentrate to equipped reservoir, then fill with water. THE BOSS Foam Cannon: 1.6oz | Foaming Sprayer: 2.0oz | Pump-Up Foamer: 0.5oz | Air FOamer Sudsing Gun: 0.25oz. USEFUL DIRECTIONS: Paint should be dry and cool to the touch. Select desired application equipment and mixing option. Maintaining a distance of 3 to 4 feet, apply from the bottom up using slow, deliberate, overlapping passes. Allow to dwell for 5 to 10 minutes. Do not allow product to dry on surface. Using a high-pressure rinse from the bottom up and top down, rinse all surfaces free of foam. Follow with Iron and Fallout Remover (which is RTU with any of the foaming application methods) or preferred wash method. Pressure rinse and dry using Griot's Garage PFM Drying Towel.